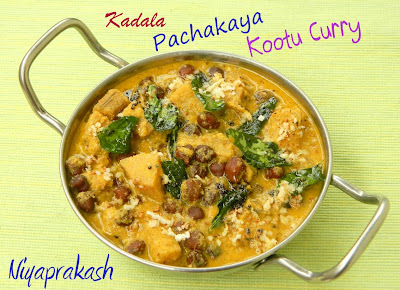 A tasty curry with rice in Kerala cuisine, made of raw banana, black channa, coconut paste and seasoning. Recipe form Vanitha magazine August 15 – 31, 2010 !! Wash and soak kadala in 2 cups water for 6 hours or overnight and pressure cook with (along with its soaked water) turmeric powder, ginger and green chillies. Water level should be 1 – inch above soaked channa. Pressure cook for 25 minutes until done and soft (reduce the heat from high after 3 whistles (3 quick whistles) and cook on a medium heat for 20 minutes). Allow the cooker to cool naturally. Remove green chillies from cooked kadala. Reserve half cup stock. Make a fine paste of above ingredients in a small mixer bowl. Sprinkle 2 tablespoon water when making the paste. In a bowl, mix boiled channa (along with stock) , cubed raw banana and salt. Mix all the ingredients well. Cover with a tight lid and cook on a medium to low heat for 12 – 15 minutes or until done / banana cubes well cooked. At this stage, add coconut paste and adjust with extra ½ cup (75 – 100 ml) water. Gravy should not be too thin. It should be medium thick in consistency / pouring consistency. Cover again and cook on a low heat for 7 minutes. Switch off the heat. Heat oil in a pan. Add mustard seeds. When they crackle, add curry leaves and fry till crisp. Pour the seasoning over curry. Heat oil in a pan and gently dry roast grated coconut until golden color. Pour this coconut seasoning over kootu curry. Serve with rice.